Our monthly webinar yesterday was about how to improve your website search in order to make more money. 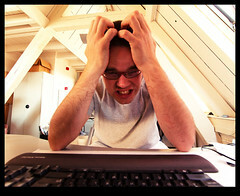 Did a frustrated searcher just ask again why your site search engine stinks? Site search foments frustration because you can’t deliver on the implied promise: “Type in anything and we’ll find it.” You’re not sure whether the problem is the search engine technology you use, the way you’ve set up the search engine, or that blasted content on your site. Your authors don’t use the right keywords, your webmasters block the spiders, marketers insist on their precious message, and tech support people write entirely in acronyms. When you add it all up, it’s a wonder anyone finds anything with your site search engine. It’s easy to change the search engine on your corporate website—at least it’s easier than fixing some of the real problems. Too often, we look at poor website search as merely a technology problem rather than one that requires analysis of content, user interfaces, search engine configuration, site design, and other factors. Analyze your website’s search in a holistic way and address all of your problems. In this 30-minute free Biznology® webinar, find out how to reduce site abandons and pogo-sticking, while actually helping your visitors get the answers to their real questions. I teach you how to use metrics and surveys to assess your website search and improve it. I’ll show you how to use multifaceted search to optimize the search results and explain how to analyze your website search experience so that searchers on your website can find what they are looking for. Are you a social media forager?